The artist's first major solo exhibition in the United States in twenty years, this show unites a group of major sculptures and installations from American and European collections. 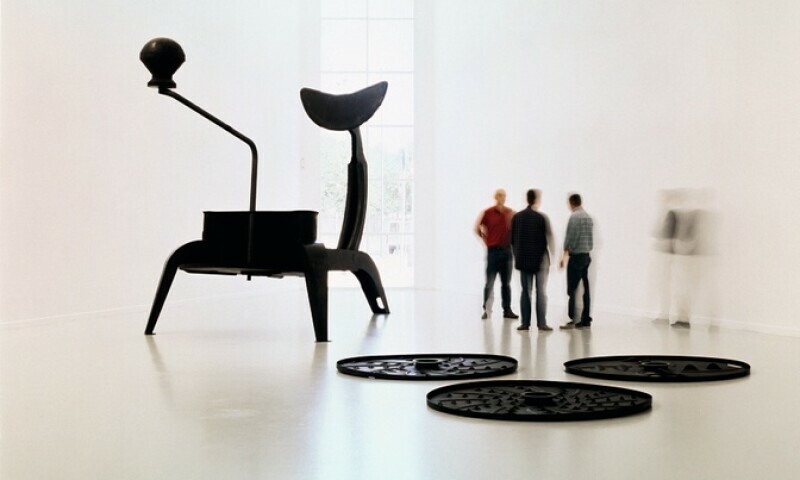 The centerpieces of the exhibition are Homebound, 1999, a room size tableaux of kitchen utensils threaded together by a crackling wire of live electricity, and La Grande Broyeuse (Mouli-Julienne x 17), 1999. In La Grande Broyeuse Hatoum has dramatically altered the size of a device designed to slice vegetables. Through her artistic process a banal object associated with the feminine sphere of domesticity becomes a strange and towering beast. Organized by Curator Michelle White, this exhibition focuses on Hatoum's investigation of the uncanny as embraced by the Surrealists at the beginning of the 20th century. The uncanny, as conceptualized by Sigmund Freud, is an instance in which something is simultaneously foreign and familiar, evoking a sense of discomfort and even terror. Transforming the everyday through nuanced and playful interventions, the uncanny has long held the power to unsettle a secure sense of place and reality within the history of modern and contemporary art. The Menil's Surrealist collection, with its well-known holdings of work by René Magritte, serve as an important backdrop to the exhibition. Mona Hatoum: Terra Infirma is accompanied by a scholarly catalogue with essays by Anna Chave, Adania Shibli, Rebecca Solnit, and Michelle White. The exhibition will travel to the Pulitzer Arts Foundation in St. Louis, where it will be on view beginning April 2018. Born to a Palestinian family in Beirut, Hatoum studied at Beirut University College, and the Slade School of Art in London, where she settled at the beginning of the 1975 Civil War in Lebanon. She has had major exhibitions at the Center Georges Pompidou, Paris; Tate London; the Museum of Contemporary Art, Chicago; and the Arab Museum of Modern Art, Doha, among other institutions. This will be the artist’s first major exhibition in the United States in twenty years. Hatoum was a nominee for the Turner Prize, 1995; was included in Documenta XI, 2002, and the Venice Biennale, 1995 and 2005; and was the winner of the 2011 Joan Miró Prize.